Sunday marks one year since Mother Lovett passed away. Some days it feels like it has been years, other days it feels like minutes. A year ago at this time, we were holding vigil in her hospital room. There were consistently about 7-8 of us there at all times. And while she only regained consciousness every few hours, she knew we were there. She died just like she did everything else in life – stubbornly. It began on a Tuesday. We all knew it was the end, and so did she – she had the mind of a 30 year old. We figured it would be over by Wednesday. So did the nurses. As the friends poured in to the hospital room, we all waited patiently – just like we always did for her. If anyone taught me patience, it was her. (Ok, her and Mr. How Sweet – he drives me batty). Just a few hours later, we knew that she wouldn’t let go easily. Or quickly. So, that’s when the party started. We were lucky enough to have a large hospice room with an adjoining private lounge, refrigerator, and table. The next logical step was to bring in the booze. After all, Mother Lovett would have wanted it that way. For the next few days, six-packs were carried in plastic bags, and handles of whiskey were smuggled inside dufflebags. But, really, do you think we could be quiet? Most mourn in sorrow and grieve over a loved one’s last few days. We didn’t. We were celebrating one of heck of a life. Soon, nurses started bringing us buckets of ice in bedpans and our secret was out. We spent 5 full days reliving her life: laughing about the tissues stuck up her shirt sleeves, giggling about the parmesan cheese in her fridge that expired in 1996, howling over her rolling down the grassy bank while she was picking weeds, and wondering why she was so obsessed with spying on her neighbors. We reminisced about the time she wrote ‘Merry Christopher’ instead of ‘Merry Christmas’ on one of our Christmas cards, and how her 4-foot frame would teeter-totter in 2-inch heels every Sunday to church. We didn’t realize the tiny things we’d miss – like the times she’d claim she wasn’t hungry, then eat 2 pieces of our pizza or swipe a cheeseburger from our Happy Meal. Or how she’d talk about the Young and the Restless like she truly knew each character. Or how she’d send us to the store for the 2 most uncomfortable items any grandchild could ever buy – maxi pads ‘without wings!’ and stool softener. Never did we think that we would miss grocery shopping with her – slowly walking behind her as she pushed the the cart, which she was only as tall as. Blushing wildly and pretending like we didn’t know her as she passed gas with each step down the cereal aisle. Becoming more furious as she argued with us over and over that oatmeal cream pies couldn’t possibly cost that much these days. We are pretty darn sure that her death took so long because my grandpa was pushing back from the other side. He just wasn’t ready to be nagged again. He was enjoying his peace. We spent a solid 5 days with her – eating, drinking, and laughing around her as she slowly left this world. It may sound odd, or even disrespectful to some, but that is just how we are. She wasn’t conscious, but I know she felt us around her. There is no better way I can describe my incredible family than to explain those last few days of Mother Lovett’s life. Living, loving, laughing, and crying together to celebrate this sassy, stubborn, sweet and vibrant woman. No wonder she took she long to die – would you want to leave a party like that? I have to admit – there weren’t many tears shed at Mother Lovett’s funeral. As I said before, she lived an incredible, fulfilled life equally full of joy and struggle. We all knew it was her time to go. There was no better way to honor her than to celebrate a life that was truly lived. Growing up, Mother Lovett made some fabulous chocolate chip cookies. As we all grew, her chocolate chip cookies reflected her age and physical struggle. Each year, they’d become more brown and burnt because she couldn’t hear the oven timer buzz, and she was too blind to see if they were golden brown. I specifically remember one beach trip when the cookies were so badly burnt that we stuffed a loaf of bread inside the container. Have you ever tried that?! They cookies pull all the moisture out of the bread and get super soft! I wish I could share Mother Lovett’s cookie recipe with you. I really do. The truth is, I have no idea what it is. In fact, I don’t even think she knew what it was. It was just one of those recipes that magically came together with a grandmother’s hand. Mostly because, you know, she couldn’t see the ingredients she was adding to the mixing bowl. And truthfully, I am afraid of some of the ingredients that made their way in there. I have no recipe to share, yet I don’t really think it matters. Cookies like hers can’t be duplicated. If you couldn’t already guess, we do party. And we always raise our glass to her. 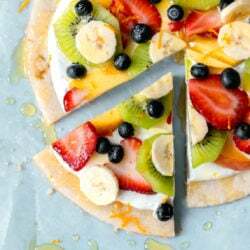 Fruit Pizza on a Sugar Cookie Crust. Omg. I am so glad I found this blog. You write just like I do…. out of mouth onto paper. So sorry for your loss, but you all certainly had an awesome going away party for her and she got to be there for it to some degree! I cried and smiled when I read this. You passed the 5 year mark now. May she still be resting in peace or, more likely, carrying on in the afterlife! I want to join that party! Wow! 2017. I met Mother Lovett December 2008. I had a new liver, a new knee and I spent a LOT of time in bed reading blogs. You had a lot of Christmas cookies and I was so happy. I’m still so happy when you post. I’m gonna try that easy Asian chicken soup. (What makes sesame oil TOASTED?) Lets party!